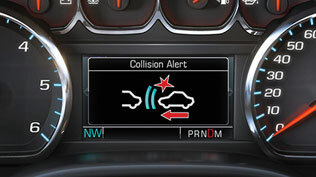 Forward Collision Alert is a General Motors active safety technology that provides alerts to help the driver avoid crashing into a vehicle they are following, whether that vehicle is moving or has come to a stop, or lets the driver know if they are following a vehicle ahead of them too closely, known as the Tailgating Alert. The performance of the system, such as vehicle detection range, inclement weather performance, and reaction to cut-in vehicles varies based on the type of system used. The timing of the Tailgating Alert and Collision Alert depends on the Forward Collision Alert’s timing setting, comprised of Far, Medium or Near. The driver can toggle through these settings using the steering wheel. For vehicles equipped with Adaptive Cruise Control, changing this setting also adjusts the gap between your vehicle and the following vehicle.